Today is all about the green movement. It is all about the safe treatment of animals (as it should be). 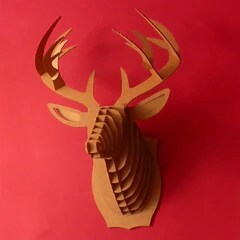 And now, we have a product that combines these two opportunities: a recycled cardboard deer head. The perfect decor addition for any home, especially a rural route abode. It even comes in two color options to correlate with any color scheme! What a creative use for an agricultural resource (trees). Now, I’m just wondering, is this something I will be seeing at dinner parties in the near future? And is there an addax version?